Thoughts from a Traveling Tech: All the time? Went to lunch with customers the other day. As we were all sitting there eating I noticed this sign between the doors inside the restaurant. 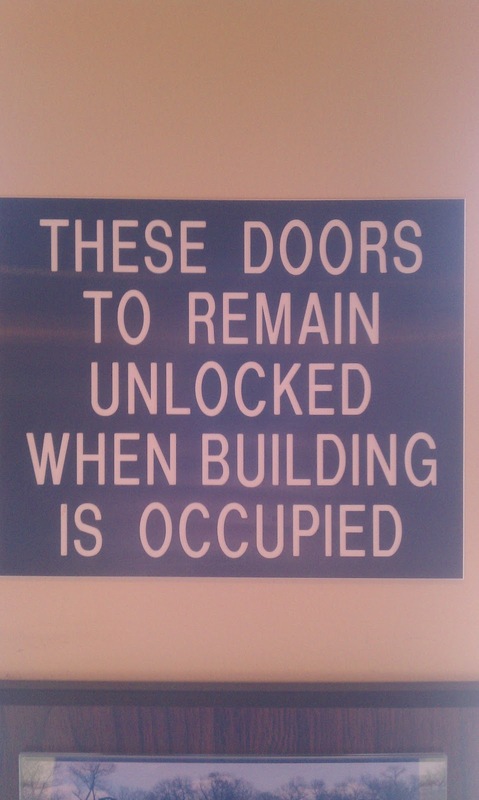 It seems that there is a requirement to keep the doors open. But then I had to think... "What about when it is after hours?" It seems to me that after hours I would rather keep the doors closed and locked so I can clean up in peace while the guests stay outside and where they can't get in the way. I've seen this signs too. They make me wonder why you would lock the door whn you wnt business. I never thought about when the business is closed and the cleaner is there. Either way, why do you need a sign. Makes me wonder what caused this ordinance? I believe this is usually because of a state law that they have this sign up. 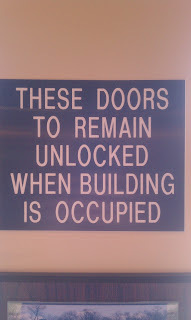 However, the wording of the sign does lead to interesting literal interpretation.